D.W. Griffith's controversial 1915 silent classic is coming to Blu-ray in November. In an early announcement to retailers, Kino Video says 'The Birth of a Nation' will hit Blu-ray on November 22. [DISC 2 - DVD]: Is a DVD copy of Kino's ''Griffith Masterworks'' edition of the film restored by David Shepard of Film Preservation Associates in 1993. It contains an orchestral score adapted in 1993 from the original score by Joseph Carl Breil in 2.0 Stereo and ''The Making of The Birth of a Nation'' (24 min.) Produced by David Shepard and compiled and written by Russell Merritt. 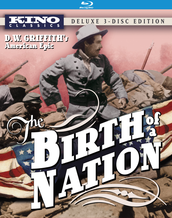 [DISC 3 - DVD]: SPECIAL FEATURES: (also on DVD ported over from Kino's ''Griffith Masterworks'' edition) that includes a filmed prologue to The Birth of a Nation (1930. 6 mins. Featuring D. W. Griffith and Walter Huston), Civil War Shorts directed by D. W. Griffith: In the Border States (1910. 16 mins.) The House with the Closed Shutters (1910. 17 mins.) The Fugitive (1910. 17 mins.) His Trust (1910. 14 mins. -- courtesy David Shepard. Music by Robert Israel, performed by the Biograph Quartet) His Trust Fulfilled (1910. 11 mins.) Swords and Hearts (1911. 16 mins.) The Battle (1911. 17 mins. ), New York vs. The Birth of a Nation -- an archive of information documenting the battles over the film's 1922 re-release, including protests by the NAACP, transcripts of meetings, legal documents, newspaper articles, and a montage of scenes ordered cut by the New York Censor Board. Excerpts from a The Birth of a Nation souvenir book (1915) and several original programs. You can find the latest specs for 'The Birth of a Nation' linked from our Blu-ray Release Schedule, where it's indexed under November 22.